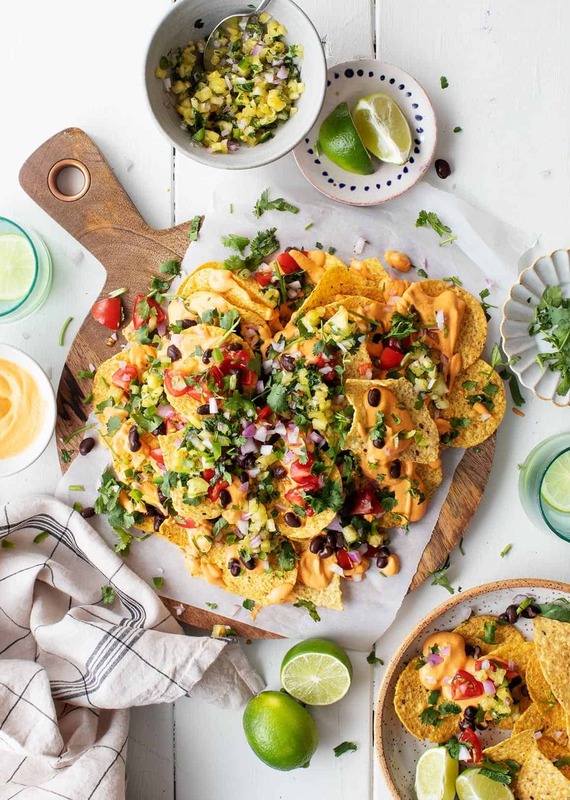 This is a nacho plate that you can feel good about! Instead of weird boxed nacho cheese, we’re making an oozy, spicy cheese-like sauce out of cauliflower. Seriously, is there anything that the mighty cauliflower can’t do? What’s in Chipotle Cauliflower “Cheese” Sauce? Cauliflower makes up the bulk of the sauce and contributes to its luscious creamy texture. Potato gives this “queso” the oozy, thick consistency typical of classic nacho cheese. Cashews combine with the cauliflower and potato to perfect the cheese’s creaminess. They also add necessary richness. Apple Cider Vinegar makes it tangy. Olive oil adds richness along with the cashews. Garlic, onion powder, and sea salt balance & perfect its flavor. 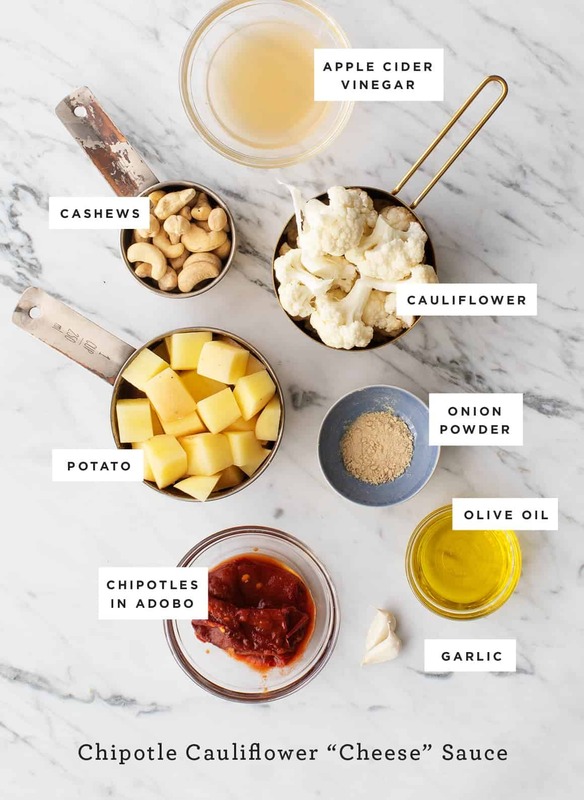 Cook the cauliflower and the potatoes, then blend everything in a blender, and voila! The special ingredient (aside from the hidden cauliflower) is the chipotle pepper. You can find canned chipotle peppers in adobo sauce at nearly every grocery store in the Mexican aisle. These canned peppers are spicy but – most importantly – they also have a wonderful, deep, smoky flavor. That smoky flavor in the sauce is such a delicious contrast to the sweetness of the pineapple salsa. Don’t forget your nacho toppings! 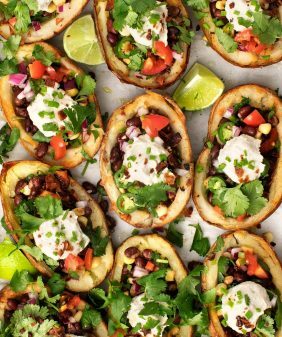 Load these up with black beans, tomatoes, diced red onion, and cilantro, and you have a hearty, healthy nacho plate that’s practically meal-worthy and definitely party-ready. If you have the time, I highly recommend making the pineapple salsa here, because the sweet/smoky contrast it adds takes these nachos over the top. 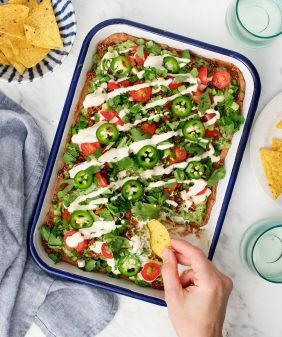 These nachos are topped with an oozy, smoky chipotle cauliflower "queso" that's totally vegan! Many toppings would be fair game here, but the sweetness of Pineapple Salsa against the smoky queso is absolutely delicious. Make the sauce: Place the cauliflower and potatoes in a medium saucepan and cover with cold water by about 1-inch. Add a pinch of salt. Bring to a boil, then reduce the heat to a simmer and cook uncovered until fork-tender, 8 to 10 minutes. Drain, let cool slightly, then place in a high-speed blender with the cashews, water, apple cider vinegar, olive oil, chipotle pepper, garlic, onion powder, and salt. Blend until smooth. 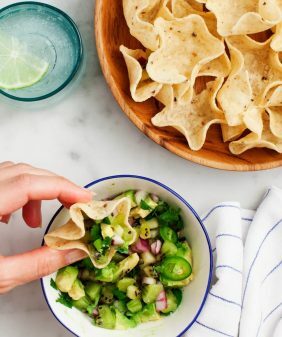 Spread the chips onto a platter, drizzle with the chipotle cauliflower sauce, and top with the cherry tomatoes, black beans, scoops of pineapple salsa, red onion, and the cilantro. Serve and enjoy! *This sauce is mildly spicy. If you want a spicier sauce, add an extra chipotle pepper or a scoop of some of the adobo sauce, to taste. Any suggestions for making it but free?? Hi Lauren, you can use raw sunflower seeds. It won’t be quite as smooth but will still be very delicious! You might have to add a bit of water to the blender if it’s too thick (1 tablespoon at a time). Hope that helps! Love your blog and your recipes! Can’t wait to try these. HOLY MOLY! These look incredible! 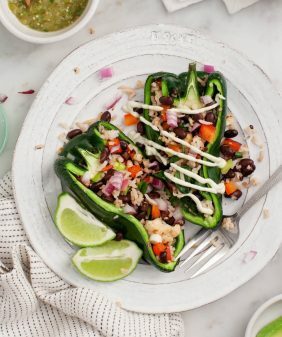 This looks amazing and so veggie packed! 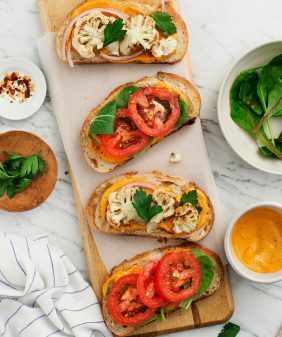 The canned cheese sauce also scares me, so love this alternative! Do you have any idea how long the cheese sauce will keep in the fridge? A couple days? Hi Anna, it’ll last a few days – 2-3 is best. It thickens in the fridge so you might have to stir in a bit of water before you drizzle it over the nachos. It can also be enjoyed as a dip. This was so easy to make and delicious! The cheese sauce was so much more satisfying than dairy or whatever that bright orange stuff is they put on stadium nachos. I actually added some nutritional yeast to up the cheesy factor. I’m already thinking of using this sauce for queso dip and vegan chili con queso! Hi Brooke, I don’t soak mine – I use a Vitamix and they blend super smoothly without soaking. Depending on your blender, you could soak and drain them (30 minutes or overnight if you think of it) prior to blending. It’s similar but the smoky flavor is less necessary (you can omit the smoked paprika). I think the cauliflower sauce might be a bit bland without the savory chipotle flavor. 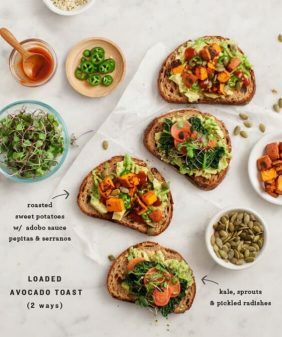 Would it work to use sweet potatoes instead of regular? Thanks! Making for a party tonight. Oops, so sorry for my slow reply! Let me know how it went – the regular potato adds the oozy texture. These are the best vegan nachos I’ve ever tasted.